The new development bank will support small and medium-sized businesses that are involved in innovative projects. The BRICS grouping recently signed a cooperation agreement in the field of innovation. Vnesheconombank Chairman Vladimir Dmitriev said the document calls for “financial participation of the development bank in supporting cooperation between our countries in this area.” This mainly involves support for innovative small and medium-sized businesses. According to Dmitriev, a number of areas have already been identified (including pharmacology and biotechnology), in which it is possible to establish joint ventures with the support of development banks. These companies, in turn, will finance promising innovative projects. The amounts of funding have not been disclosed yet. Ksenia Belikova , Professor of the Department of Civil and Labour Law of the Peoples’ Friendship University of Russia, pointed out that the BRICS countries started with different levels of development in their own innovations. She believes that the BRICS countries formulate their ideas in the field of innovation-based development in order to obtain the desired result with limited resources and a minimum investment of time, energy, and finance. “In this format, the agreement suggests financial participation of the development bank in a timely manner and promotes cooperation in many promising areas based on the complementarity of existing resources,” says Belikova. The potential for cooperation, in her opinion, lies in overcoming a number of common challenges: dependence on foreign technology, lagging behind in the high-tech areas, removal of restrictions of private investments in the development, and implementation of new technologies. The mechanisms used in the BRICS countries are about the same, says Belikova. On the one hand, there is the building of an innovative system in which corporations go to universities for breakthrough technologies, and the state is co-financing the development of next generation technologies. On the other, the transformation of small and medium enterprises into the main driving force of the construction of an innovation system. “The implementation of these mechanisms contributes to the restructuring of universities, grant funding of developments, state programs targeted to support innovation and small and medium enterprises, the increase in appropriations for R&D in GDP,” Belikova says. Director of BDO in Russia Eduard Rumyantsev sees the potential of cooperation in innovation in the BRICS countries in the establishment of joint research programs and funding the most promising areas for innovation. “The ultimate goal of this cooperation is to strengthen the BRICS countries in the competition for innovation with European countries and the United States,” he says. He also said that Russia would receive a direct benefit from the cooperation – from knowledge sharing, creation of joint innovation companies to obtain financing from the member countries of the BRICS against the background of the sanctions imposed by the West, including the science field. “In fact, by taking this step, Russia is showing that it is ready to strengthen its cooperation with the BRICS countries in response to sanctions,” he adds. This is confirmed by the recently published Global Innovation Index 2014, compiled by the Cornell University, the French business school INSEAD and the World Intellectual Property Organisation. This year China was really better than all of the BRICS partners – it took the 29th place, improving its position by 6 places. Russia, however, has demonstrated better dynamics, not only among the BRICS member states, but in general among all the 143 countries in the ranking. It took 49th place, having risen by 13 places compared to the previous year. South Africa took the 53rd place, having gone up by 5 places, Brazil – to 61st place (+3 places), and India is at the 76th place (same as a year ago). In another ranking of the BRICS universities 2014-2015, complied by the QS agency, Russia managed to get closer to China. China’s Universities took the first two places (Tsinghua University and Peking University), and Lomonosov’s MSU was the third. In total, 19 Russian universities made it into the top 100. Moreover, if according to the ‘academic reputation’ indicator, all three leaders received the maximum rating of 100 points, then according to the “share of scientific papers per teaching personnel in the faculty” indicator, MSU is far behind: it has only 37.5 points, while Tsinghua University has 97, 5, and at Peking University has 89.6. 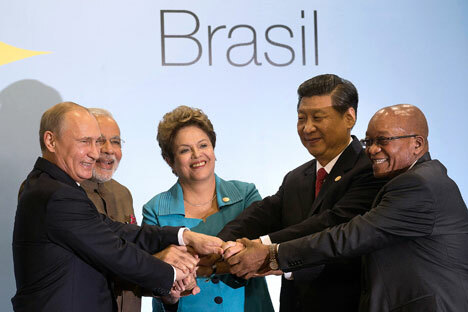 Both Russia and other BRICS countries have much to learn from each other. Vladimir Dmitriev said that the ‘Open Innovations’ conference, which will be held in Moscow in October, will be used to introduce foreign partners in the BRICS countries to Russia’s experience in the area of innovation.